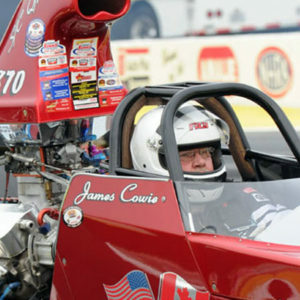 James started drag racing in 1972, winning various local, divisional and national events. Someone once said that he was like a “lone wolf”, the Spanish translation for that is “lobo” so that was the name he put on his cars. He built and did the work on the cars himself except for the rear quarter panels and the roof. James Cowie is one of the Maritimes most recognized drag racing names. He is active in IHRA and NHRA as well as local Eastern Canadian ET Bracket circuits. His resume includes winning the Super Comp title at the 1991 NHRA Winston AAll-StarRace, Rockingham, North Carolina and the 1994 Quick Rod title during the IHRAs Northeast Nitrous Nationals at Epping, New Hampshire. He figures he spent about 2 ½ to 3 months a year travelling around North America to participate in races. Add to that he campaigned two race cars; the word “dedication” comes to mind.